We are continuing to publish reflections on parishes' missionary work in response to Fr. Daniel Sysoev's article. Fr. 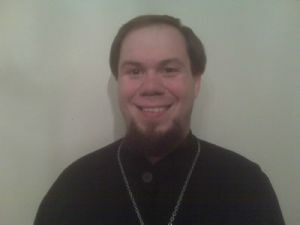 Oliver Herbel, rector of Holy Resurrection Orthodox Mission Church in Fargo, North Dakota. Many Orthodox Christians have learned of Fr. Daniel Sysoev’s murder. One of the thingst that stood out about Fr. Daniel was his missionary efforts and the missionary impulse of his parish. Like parishes in North America, their parish had started small as well. As a priest in North America who is indebted to the Russian Mission that began in North America in 1794, I thought I would reflect briefly on the Fr. Daniel’s missionary methods in a comparative way. Are there parallels that we may draw between his parish and missions here in North America? One aspect that grounded his parish was prayer. The parish, from the start, held prayer vigils, keeping a rotating prayer cycle active. There is no question that mission parishes in North America must also be grounded in prayer. Indeed, I think if we try to do anything without prayer, we will fail, and if we succeed despite our lack of prayer, that is only further evidence of God’s gracious mercy or an impending fall brought on by the Devil. Always be fearful of succeeding without prayer. We need prayer. In many small missions in America, a constant cycle at a parish building will not be possible. Many missions are small, very small. Many have a significant majority working during the day or caring for a large family of children. In some places, Orthodox Christians have to drive one or two (or more!) hours just to get to a site of Orthodox worship. Furthermore, my choice of the word “site” is not accidental. Many missions do not have permanent physical worship space. What can be done in small missions, however, is regular, daily prayers by all of the clergy and laity. This might not be the same as what Fr. Daniel established within his parish, but the intention should be similar—to keep our missions (indeed, all parishes) grounded in a life of prayer. Providing literature, including service books is something most, if not all, missions in America already do and that is an important aspect to our evangelization. This is a direct parallel and one that we must continue. Many visitors to our own humble mission here in Fargo, ND, have made use of such resources. There have been various times in the history of the Russian Orthodox Church when frequent sermons were utilitzed to help instruct the people. There is no reason why missions could not have priests that gave sermonettes after vespers or vigil. Definitely, a sermon must be given on Sunday and festal liturgies. In addition, the priest and educated laity (with their priest’s blessing) should be encouraged to give occasional presentations to the parish body. Perhaps, as at Fr. Daniel’s parish, this could be done after bible studies or other lessons. Regardless, the parallels are striking and important because these sorts of educational aspects are necessary. After all, we are called to love God with all our mind. Developing ministries for the elderly, as Fr. Daniel developed the grandmothers' voluntary missionary groups, could work well in America and North America. Many parishes and missions already seek to develop ministry groups within the parish. Again, the parallels are present, even if the groups and activities are not exactly the same. Being bold enough to accept invitations to speak to non-Orthodox groups (Christian or otherwise) is vital and I must admit, in America, I think we are hit-and-miss on this. Even priests are inconsistent. Some of us seek out such opportunities, but not all do. For those who do not, we could learn from both Fr. Daniel and those here in America already doing that. Laity should also consider doing such things and the fact that Fr. Daniel had missionaries trained to do just this is impressive. I think we Orthodox in America could learn from this example. Whether preaching on the streets would work in America is harder to say. There are only a few examples of this amongst Orthodox here in North America and some non-Orthodox who do this, but in America, this often creates barriers rather than invitations. It may be easier for parishes that already have established buildings in areas of town where this could work. A related problem is the fact that many Americans commute to work in an automobile rather than walking. In America, this might not be a productive use of energy and resources for many parishes but that does not mean there would not be similar things that could happen, such as the above mentioned talks to other groups. What can and should be done, and is similar, is working hard to have newspaper articles and other journal articles and magazine articles written about a local Orthodox parish. This is not the same as preaching in the streets, but it is a means of getting an informed message to non-Orthodox (and nominal Orthodox) in America. When a parish blesses the waters on Theophany (and I pray every mission does—how can it not), does the parish contact the local newspaper? Also, are we telling our friends, family, and co-workers about our Orthodox faith and the parish we attend? This is not the same as preaching on the streets, but it is similar. Fr. Daniel’s most powerful witness, however, is his willingness to remain bold even in the face of death threats. His boldness in Christ should humble us all. America is slowly changing. One example of how may be found here. America is also changing in that some do not want any religious discussions in the public forums at all. Instead of upholding freedom of religion, such people want freedom from religion. We should learn from all of the martyrs of the Church and Fr. Daniel about how difficult such a situation could become. Please do not misunderstand. I am not saying America is that bad. Nor am I saying America is definitely sliding down such a slippery slope. Whether it will remains to be seen and many of us will fight against that. What I am saying is that we should be inspired to go forth and make disciples in this nation, a nation whose early ”founding fathers” looked to the classical age and ancient Rome herself, a nation that has allowed us the religious freedom to be missionary in spirit without serious fears. There are many ways in which Orthodoxy’s Tradition can intersect with American history and culture and we should be bold. Fr. Daniel was bold on behalf of the Gospel. I hope we shall continue (or begin to be) bold for the Gospel’s sake as well. May Fr. Daniel’s memory be eternal!